Two pits are being excavated at a former children's home in Jersey where police are investigating abuse claims. It follows information from a man who said he had been asked to dig the pits in the 1970s or 1980s, but staff had refused to explain why. Police said one was filled with a large amount of lime. The second is near a boys' dormitory at Haut de la Garenne. They are asking former residents or staff who may have information about the pits to contact them. The witness told police when he asked the carers what the pits were for he was told it was "none of his concern". He was asked to fill in the pits the next day and said he approached police because the incident had played on his mind for some years. Jersey Police said they had excavated the first pit and were working on the second. A spokeswoman said: "The team excavated the first pit and found it to be about 1.5 metres (5ft) deep. "At the bottom of the pit was a large quantity of lime. There was nothing else in the hole. "The inquiry team can think of no reason why this pit would have been created, nor why it was filled with lime. We would emphasise that we have no evidence of any motive." 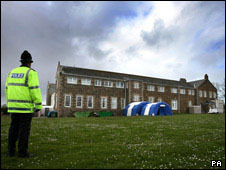 In 2006, officers began covertly investigating claims of sexual and physical abuse of children dating back to the 1960s at Haut de la Garenne, following allegations by former residents. The investigation was stepped up in February after police found the partial remains of a child's skull buried in concrete in a stairwell. Police are continuing to excavate a network of four underground rooms which have been uncovered. They have found a number of items, including shackles and a bath, which they say corroborate claims from victims.